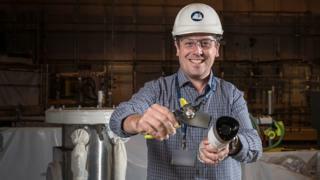 The handbrake from a scrapped 1968 Ford Cortina has been used to make a tool for surveying the inside of a nuclear reactor. Can opener parts were also used to make the device, which was fitted with a camera and rolled into confined spaces of Dounreay's Prototype Fast Reactor. Chris Irwin, a senior design engineer, designed the low-cost invention. The PFR is among areas of the Caithness nuclear power site being decommissioned at a cost of millions of pounds. Mr Irwin's idea for a device to go inside the reactor to make surveys came to him while making a snack. He said: "I was opening a can of beans at home and realised that the cutting wheel of a can opener was exactly what was needed to make the required diamond shaped wheel. "I bought four of them and took the wheels off. "The camera needed to be guided over obstacles within the reactor, so we realised the incremental nature of the clicks on a handbrake would give us the precise control that we needed." Staff at Dounreay are frequently challenged to find cheap ways of helping the decommissioning work at the plant near Thurso. Previous innovations have included using a silver ironing board cover and a duvet to make a hood to insulate and protect a robotic camera built to explore pipes inside the Dounreay Fast Reactor. Cardboard tubes inside rolls of paper towels have been used as a solution to a problem operating a piece of equipment used to treat radioactive waste at the plant. And a design engineer at Dounreay used the castors off his own living room couch to stop a machine dubbed the "hedgehog" from toppling over. The device was built to probe radioactivity levels and shoot video inside the PFR. In tests, the device kept toppling over when turning corners. However, senior design engineer Calder Bain used the castors to stabilise the "hedgehog". Sticky putty and household cleaners have also been used to overcome complex problems in the past.